A Chicago man lost his job after an “offensive and inappropriate tweet” was sent from his account Tuesday night berating the widow of a fallen Navy SEAL who was honored during a speech by President Donald Trump, the man's former employer says. The tweet was aimed at Carryn Owens, whose husband, Chief Petty Officer William "Ryan" Owens, 36, of Peoria, was killed in a gun battle with al Qaeda fighters during a raid in Yemen last January. "Sorry Owens' wife, you're not helping yourself or your husband's memory by standing there and clapping like an idiot. Trump just used you," the tweet sent from Daniel Grilo's account read. The account has since been deleted, but many users circulated screenshots of the comment, including Donald Trump Jr. 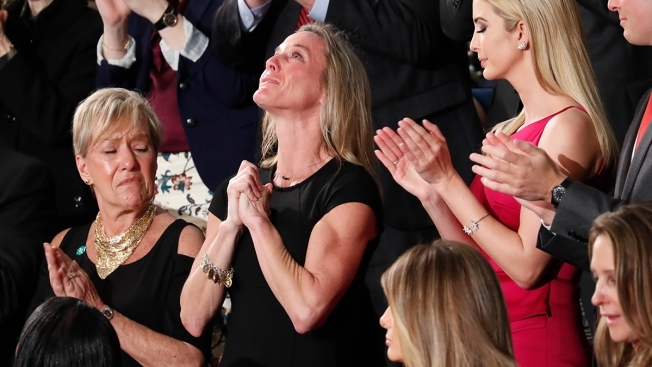 The critical comment from Grilo's account was made during Trump’s address to a joint session of Congress in which Carryn Owens was given a sustained ovation after the president thanked her and lauded her slain husband as a heroic warrior. A visibly emotional Owens, seated next to Ivanka Trump during the speech, clapped, clasped her hands and looked upward with tears streaming down her face. Grilo was a principal at Liberty Advisor Group—but his profile page on his employer’s website has since been deleted, and the financial firm has issued a statement about the tweet. Grilo received public backlash despite several apologies he made about his "poorly worded" tweet. "I apologize, I believe parading Ryan's wife's pain like that was shameful after his morning comments," one of Grilo's tweets read, adding that he was happy to see his critics "inspired to protect Gold Star families." Grilo's Twitter account reportedly said he volunteered for Hillary Clinton's campaign. Efforts to reach Grilo by telephone were not successful. The raid Ryan Owens was killed in has been surrounded by other controversies, such as civilian deaths and Owens' father refusing to meet with Trump, as well as conflicting reports on the planning and results of the raid itself.